Doha Sandwich Panels Factory, established in the year 2010, started to manufacture sandwich panels which are used to fabricate energy-efficient cold rooms, walk-in freezers, industrial buildings and vehicle bodies' panels that provide maximum insulation. Our production line has capacity to accommodate various custom sized panels, up to 8m in length and 150mm in thickness that are produced for every project with our experienced team of engineers & technicians. Doha Sandwich Panels is one of the leading manufacturer of sandwich panels for Isothermal bodywork for refrigerated trucks and insulation of cold rooms in Qatar. Its many sustainable benefits are guaranteed to be realized from the time it is manufactured and used. Experience the long-term performance as a structural building component. Our reliable and flexible products and operations save your time and money. We strive to achieve energy-efficient cold rooms, walk-in freezers, industrial buildings and vehicle bodies by the production of sandwich panels that provide maximum insulation. Authorized Dealer of Hwasung Thermo Transport refrigeration cooling units for Qatar. Hwasung Thermo is the first and No.1 Transport refrigeration manufacturer in Korea and also known as the OEM supplier of Hyundai and Kia Motors. 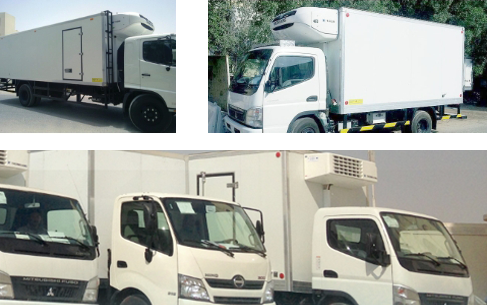 Dsp manufacturers insulated vehicle bodies for transporting refrigerated cargo in the state of Qatar Since 2010. The use of Polyurethane Sandwich Panels used for this purpose has lots of advantages like providing superior insulation property. Polyurethane Sandwich Panels are manufactured at our factory for constructing Walk-in-Chillers and Freezers in standard sizes, with internal volumes ranging from 4000 liters to 20000 liters. Fully committed to the hard work, and the work environmental principles such as integrity, transparency and credibility in the work. Following the open doors policy requirements, people respecting, and accepting the criticism. Achieve the highest benefits to our clients by exchanging it with the best prices and fastest services.